We are Worldwide Dream Holidays Limited trading as Worldwide Dream Holidays (WWDH), and we also trade as trading as Worldwide Dream Villas and Holidays, Barbados Dream Villas, barbadosdreamvillas.com, barbadosbeachhouses.com, sandylanevillas.com, holidayinbarbados.com, Barbadosvilladeals.com, Grenadadreamvillas.com, Mexicodreamvillas.com, worldwidedreamislands.com and Ibizadreamvillas.com. We have an office in Barbados handling real estate, property management, villa rentals and hotel accommodation. Reference to “Company”, “we” or “WWDH” refers to Worldwide Dream Holidays Ltd acting as an independent agent for both Customers, agents and Owners. Owner or Property Owner refers to owner of the Property (WWDH is not the villa owner) or the relevant hotel. Contract/agreement - This agreement/contract is between the property owner and the principal guest ('you') who has completed the Booking Form via WWDH. The following booking conditions outline the terms under which WWDH operate. They advise you of your obligations to WWDH and also the obligations of WWDH to you. Please ensure you read them carefully before proceeding with your booking. The principal guest who completes the booking information, must be 18 or over and one of the travelling party (unless another person has been authorised to do so). Once the booking form information is completed this certifies that he/she is authorised to agree to our Terms & Conditions and acts on behalf of all persons included on the Booking Form including any additional guests added at a later date. All descriptions on this web-site are based on inspections made by or on behalf of WWDH and information passed to us which we believe to be accurate. The descriptions have been written as each Property existed at the time of inspection and incorporate any changes notified to us before the principal guest booked the Property. Please be aware that changes may be made at any time by villa agents/Owners or hotel and these changes are sometimes made without prior warning. WWDH therefore cannot and does not wholly guarantee the accuracy of the information relating to the relevant Property and cannot accept responsibility for any changes made to the relevant Property after the descriptions were posted onto the website. Any significant changes will be actioned as soon as we are made aware of them and the relevant information will be updated. If we are made aware of significant changes after you have already booked we will advise you prior to your departure. If it is your decision to cancel at this point there may be cancellation charges. In some cases certain facilities and amenities may be affected by a change to local conditions such as bad weather or low season. Public Holidays and Festivals may also affect the availability of resort facilities. Swimming Pools are not heated unless otherwise stated. Distances to the nearest beaches can be provided and depending on location the beach may be sandy, stones or shale. The photographs throughout the web-site are to provide an overview impression of each Property or destination. WWDH cannot accept responsibility for changes made to any furniture, colour schemes, views or other matters since the photographs were taken. Provisional bookings can be arranged and potential bookings may be held for up to 48 hours pending receipt within that period of a formal confirmation and the relevant booking information. If the required deposit/payment is not received within 7 working days of the initial hold the booking will be released. Unlike some rental companies we do not charge additional booking fees o top of the price we quote you for your holiday. We do not ask for 100% payment at the time of booking, unless the booking is made within 10 weeks of arrival. A 30% confirmation deposit is usual, apart from during peak times when it may be 50%. Any additional taxes, levies and service charges will be itemized in your quote. Some service charges may apply for on island concierge services. Worldwide Dream Holidays Ltd carries TRIP financial failure insurance(Travel Regulation and Insolvency Protection) so that your client is covered in the unlikely event that we become insolvent before their date of travel. In accordance with ''The Package Travel, Package Tours Regulations 1992'' all passengers booking with Worldwide Dream Holidays Ltd are fully insured for the initial deposit, and subsequently the balance of monies paid as detailed in their booking confirmation form. 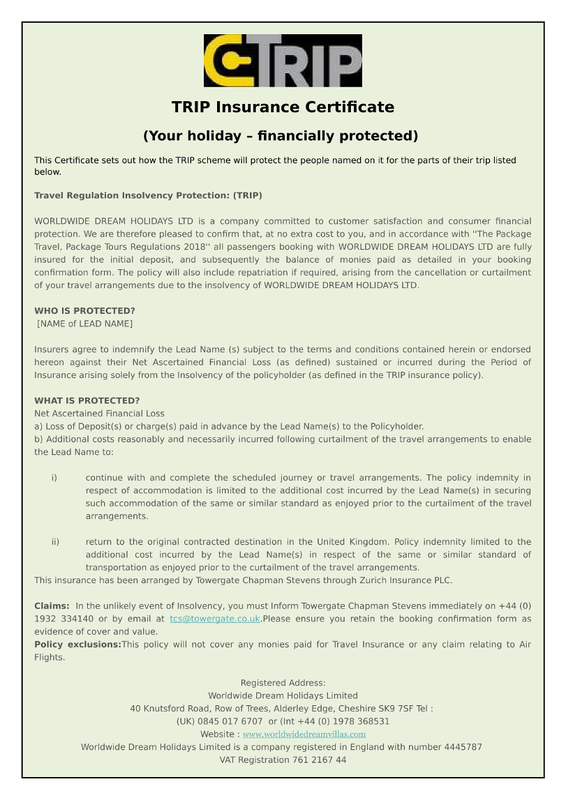 A certificate to confirm the holiday arrangements protected will be issued with the booking confirmation. The policy will also include repatriation if required, arising from the cancellation or curtailment of your clients’ travel arrangements due to the insolvency of Worldwide Dream Holidays Ltd. This insurance has been arranged by Towergate Chapman Stevens through Zurich Insurance PLC. We also carry tour operator liability insurance which protects against issues with accommodation. We do offer the facility to pay by credit card for further peace of mind. A principal member of the party must acknowledge that the terms & conditions as outlined on the web-site have been read and accepted which he/she will do by completing the on-line booking details. This person is then responsible for all things relating to the booking and the named guests. An agreement/contract will exist upon issue of a WWDH confirmation/invoice which WWDH will aim to send to you within 24 hours of initial confirmation. As WWDH acts as an independent agent for Agents and Owners this agreement/contract is between the Owner and the person who has completed the booking information and who has thereby acknowledged the terms and conditions via WWDH. We advise that you check the details of any confirmation/invoice immediately and if you have any queries please contact WWDH as soon as possible. WWDH cannot accept responsibility for any inaccuracies that we have not been notified about. After the issue of our confirmation/invoice, should you wish to make any alteration or amendment, this may involve a charge which WWDH will notify you of at the time. The final balance is payable to WWDH 10 weeks prior to departure and the balance due date will be presented on your confirmation/invoice. If payment is not received by the due date we reserve the right to cancel the reservation and your deposit will be retained and a further cancellation charge may apply. When the full balance has been received along with any required security/damage deposit and all final booking information (if applicable) your documents will be sent to you. This will usually be 10 -14 days prior your departure date. The number of staff and the hours they work vary depending on the Property ranging from a daily maid to a full team of resident staff. Your staff requirements are important to us so please let us know at the time of your enquiry whether you need any additional staff (whether it be a nanny, personal trainer, a gourmet chef or other). We will do what we can to arrange this for you and will advise you of the additional charges and whether these need to paid prior to your arrival or paid locally. Generally there are gardeners, pool attendants, caretakers, security guards etc carrying out their duties on the Property. If this will cause concern, please discuss this with us in advance. We will always aim to meet your requirements for additional staff services but we are not responsible for services provided by any third party such as an Owner or local agent etc. Most villa agents/Owners require an additional deposit to safeguard against damages etc. to the Property and its contents. This security/damage deposit is to guarantee protection of the Property and its contents and to go towards the cost of any breakages or damage along with providing payment for any telephone calls and any additional costs which may be incurred during your stay. In some destinations the deposit is requested on arrival and will need to be paid in cash or equivalent to the villa management agent/Owner's representative or may be requested by WWDH along with the balance payment 10 weeks before departure. If only an authorization is required and not an actual payment then this will be requested approximately 28 days prior to your departure. The security/deposit amount required varies depending on the Property. The required amount will be notified to you on the booking form information at the time of booking along with the payment method. All furniture, fittings, effects, facilities, keys and other devices and equipment should remain in the same state of repair and condition as it was when you arrived. Damages by you or your guests will result in an appropriate payment being made to the Property Owner direct or to WWDH as the agent. Should we arrange any extras for you during your stay, such as baby equipment ( which needs to be hired with most villas), extra beds, groceries, additional staff etc. these charges should be paid for locally unless otherwise agreed. If the pre-arranged extras are not settled prior to leaving the destination, the card used as security/damage guarantee will be used to clear the outstanding accounts and the confirmation/receipts for the extras will be sent to clarify all charges made. Check-in and check-out times can vary between properties/ hotels. As a guide we advise check-in times to be from 3pm and check-out times before 10am. Final check-in and check-out times will be advised on your final documentation. Request for an early check-in or a later check-out can be requested and will be subject to final confirmation with the Owner as this will depend on the arrival and departure of other guests on the changeover days so may not be confirmed until near to the travel date. We recommend that you advise us of your requirements when you first make your enquiry. If your arrival is delayed for any reason you should inform the local contact person noted on the final documentation which is sent to you once full balance is received for the holiday. Should you experience any delays with your chosen transportation WWDH does not accept responsibility for the problems this may cause or for the curtailment or shortening of your holiday. If you arrive after 19.00 in Europe without prior arrangement you may not be able to gain access to the Property until the following day or a charge may be levied by the Owner to arrange for local staff to organise late access. All requests should be made in advance of your departure date and in writing. We aim to accommodate your special requests but WWDH has no legal liability to you if the request has not been complied with. We will always make our best recommendations for additional staff services but we are not responsible for services provided by any third party such as an Owner or local agent etc. It is a COMPULSORY requirement that you and your party have the necessary insurance cover to protect for medical needs, cancellation or flight delays etc. and also personal liability. WWDH require confirmation of your insurance supplier along with your policy number and a 24 hour contact telephone number which must be included on the booking form. In the event of any emergency abroad this information may also be used to assist where necessary. The responsibility lies with you to ensure that any insurance policy you take out meets your personal and particular needs. Each member of the party is responsible for having valid documentation for travelling abroad and checking any health requirements. It is the responsibility of each member of your party to check they have the correct and valid passport and/or visas for your chosen destination. WWDH cannot accept responsibility for you or any member of your party failing to produce or provide the necessary documents. Any concerns should be checked with the relevant embassy or consulate well in advance of travel dates. You should also check for any necessary vaccinations and/or your doctor's clearance to travel. WWDH cannot accept liability for any illness or for any loss resulting from your failure to check and meet the necessary requirements. If you or any member of your party have a medical condition of any kind or are pregnant, you/they should seek clearance of the proposed travel plans from a doctor. If there are any financial penalties as a result of you not complying with these requirements these will be your responsibility and that of each member of your party. Payments can be made by bank transfer or selected credit cards as advised on your confirmation invoice. We do not accept cheques. On credit card payments we reserve the right to levy a 3% handling charge (no charge for Debit transactions). Prices shown on the web-site are usually for the maximum number of guests in the villa or based on 2 people sharing a hotel room/suite. These prices are updated from time to time but your specific holiday price will be confirmed to you at the time of booking. The price on your confirmation/invoice will remain the same unless the UK or the local government at your holiday destination introduces additional taxes or charges which we reserve the right to pass on to you. Any amendment you wish to make to the original booking request after the issue of the confirmation/invoice should be notified in writing and any relevant charge for this amendment will be notified to you. Should you wish to cancel the entire holiday this should be sent in writing and cancellation charges as per our cancellation policy will apply. The cancellation takes effect from the date the written notification has been received when the relevant cancellation charges become due (see table below). Reasons covered by your insurance policy for cancellation should be referred directly to your chosen insurance company to discuss re-covering the relevant cancellation charges. If WWDH becomes aware of any significant change to your chosen accommodation we may have to cancel your booking. In such circumstances we will aim in conjunction with the villa Owner/villa management / hotel/ resort to find a suitable alternative or negotiate a full refund on your behalf. Neither WWDH nor the Property Owner is responsible for noise or disturbance originating beyond the boundaries of the Property or which is beyond our/ the Owner's/hotel's control. Occasionally building work or road work/maintenance and its associated noise may occur over which, in many cases, we have little or no control. When and if we receive notification of any planned work from either the Owner, villa management, hotel or resort, we will advise you as soon as possible. WWDH accepts no responsibility when we have had no prior knowledge or prior warning. If we become aware of planned or ongoing work we will assist as much as possible and if necessary assist to find a suitable alternative. Any price difference would be discussed and agreed at the time, however, if the alternative Property/Hotel offered is more expensive then any additional payment will be your responsibility. WWDH regrets we cannot accept responsibility for loss, damage, disruption or cancellation of your holiday which has been prevented or affected by "force majeure". This would mean in a case of unusual or unforeseeable circumstances beyond our control that resulted in unavoidable events even if every opportunity to exercise due care had been taken. For example : War, riots, civil strife, terrorist activity, industrial disputes, natural or nuclear disaster, fire, adverse weather conditions, water level changes, sale of a Property and all other similar events outside of our control. You must ensure you have adequate travel insurance for your holiday and claim via your insurance company. Whilst WWDH envisages your holiday going well you may find an occasion when something is not quite as you would expect it should be. Should you have any such query or complaint during your stay you must report your problem or concern immediately to the house staff, villa management, hotel manager or resort manager and they will do all they can to assist and resolve this. If the issue/concern is not made known whilst in resort then any issue only reported when you return home may cause complications with any claim. The contact at the accommodation will advise WWDH of your issues. If you find that the problem has not been resolved during your stay and you wish to take the matter further, you should send full details in writing within 14 days of your return home. Once we are in receipt of your complaint in writing we will act as swiftly as we can and contact all concerned to ascertain an acceptable solution and bring the matter to a close. The Company will do its best to ensure that any holiday supplied, as described on our website, and the services offered reach a reasonable standard. As we act only as an agent for the Owner of the villas/hotels we present we cannot accept any liability for any act(s) or omission(s) of the Owner/hotel or anyone representing, or employed by, the Owner. We also cannot accept any liability for any shortcomings or defects with or in any Property/hotel as all Properties are within the sole control of the Owners. The contract with the owner may be subject to additional terms and conditions depending on the Property. Our maximum liability to you relating to any fault with any service we provide (as opposed to any service provided by any third party such as an Owner or local agent for whom we are not responsible) is limited to the commission we have earned or are due to earn for the booking in question. Operational decisions may be taken by air carriers and airports resulting in delays, diversions or rescheduling. The Company has no control over such decisions and is therefore unable to accept responsibility for them. Neither we (owners and employees of WWDH, acting as agent for the Property Owner) nor the relevant Owner shall be responsible for the death of or personal injury of you or any person named on the booking form or any other person at the property unless this results from the proven negligence of the Owner, (in which case the Owner (but not WWDH) may be responsible). We cannot be held responsible for the breakdown of mechanical equipment such as pumps, boilers, swimming pool filtration systems, domestic equipment, nor for the failure of public utilities such as water, gas and electricity. Once an equipment fault is reported to either the Property staff, the agent, the villa Owner, the hotel or WWDH, we will do our utmost to ensure that appropriate action is taken to address the fault as soon as possible. WWDH has no liability to fix the fault. This lies with the Owner of the property. The lead person on the booking who has acknowledged our terms and conditions is responsible for the correct and decent behaviour of the party and each person named on the booking form. Should you or any member of your party not behave in such a manner this may result in you and your party being asked to vacate the Property without a refund of the price. The copyright in the information contained within this web-site belongs to Worldwide Dream Villas and should only be used for customers' personal use and not for any commercial purpose.